BBC NEWS | South Asia | Analysis: Why attack Lahore? Lahore - Pakistan's cultural capital - has been the scene of a string of brazen militant attacks this year. Three simultaneous raids on law enforcement agencies across the city on 15 October underline the fact that the Punjab provincial capital remains a militant target. It is a clear statement from the militants who are under threat from Pakistani troops massing on the Waziristan border - they are alive and well and can strike back. In May the suicide bombing of the police emergency response headquarters on a heavily guarded section of Lahore's Mall road made the city feel as if it were under siege. 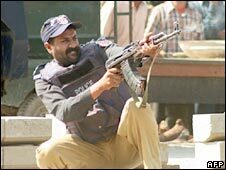 On 30 March 2009, a raid on the Manawan police training centre near the city underlined the fact that Lahore is a new frontline in Pakistan's struggle against militancy. The attack on Sri Lanka cricketers in Lahore on 3 March had made headlines around the world. According to security officials, part of the reason Lahore is now under threat may be because it has previously been seen as stable. "Lahore is the only city in Pakistan which has remained relatively peaceful since the 9/11 attacks," a security official said in May. "It has been Pakistan's saving grace, and whoever wants to destabilise the country or the government, would go after Lahore." There are a number of reasons why Lahore could be the centre of such attacks. Many people have suspected Taliban militants in Pakistan's north-west. Almost all major attacks inside Pakistan in recent years have been traced back to the tribal areas near the Afghan border, the authorities say. Taliban militants fighting the Pakistani army have openly admitted planning and carrying out many of the attacks. Earlier this year, they issued a propaganda video claiming a number of suicide bombings on security forces over the past two years. At least two of them were carried out in Lahore. There are also growing fears that attacks are being carried out by militants based in Punjab itself - the Punjab Taliban - in co-ordination with their counterparts in the north-west. Fingers have been pointed at Lashkar-e-Taiba, as they were after the attack on the Sri Lanka team. Some experts say the attacks could be retaliation by elements within the group for the crackdown on it following the attacks in the Indian city of Mumbai (Bombay) last November. Others, like Pakistani Interior Minister Rehman Malik, accuse another militant group, Lashkar-e-Jhangvi, which the US believes has close ties with al-Qaeda. "Almost all the recent major terror attacks have either been claimed or traced back to the Lashkar-e-Jhangvi," he told reporters in Lahore in March. 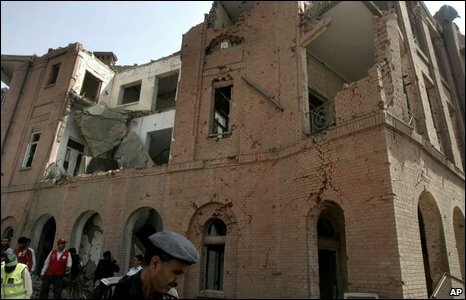 Lashkar-e-Jhangvi is also implicated in the October 2009 attack on Pakistan's army headquarters in Rawalpindi. Many analysts are quick to point out the change in tactics - but what many seem to have forgotten is how it all began. Pakistani militants only started using suicide attacks in a co-ordinated manner in 2004. The first target was Karachi, where a series of bomb attack in May of that year left more than 100 people dead. Since then, they have become increasingly frequent, with suicide bombings almost a daily occurrence in the north-west. While experts have suggested a number of theories for this change of tactics, the militants themselves say there was one clear reason. "We started using the suicide bomber because we were under siege at the time," a militant leader told me in 2006. "We were short of trained men as many had been arrested or killed in the crackdown following 9/11. The places where we could set-up training camps were also declared out of bounds. "The easiest way to fight back was to use a bomb and the easiest way to ensure its success was to use someone to manually detonate the device. Little training was needed, and the younger the bomber the easier it was to convince them," the militant said. But he added that the suicide bomber was not always effective, especially if the target was spread over a large area. "We will eventually start using assault tactics again, when we have regained our strength in men," he concluded. That increasingly appears to be the case, as the militants deploy a variety of different tactics in the field. More than anything, this means that whatever Pakistan's government says, the power of the militants has increased substantially over the past two years. There have been several setbacks for Pakistan's Taliban - notably when their leader, Baitullah Mehsud, was killed in August 2009 - but the militants have struck back with renewed ferocity. Political instability has given them encouragement, and they have thrived as they once did during the 1990s under state patronage. Whether Pakistan's current government is up to the task of defeating them remains to be seen. President Asif Zardari's government certainly has the desire to go after the militants. But whether it has the required backing from the military is an open question. Pakistan's military has always seen the country's "strategic interests" through a different lens from the civilian governments. In the past the military has acted as godfather to the militants. But never has the country faced as great an internal threat as it does now. Experts say the situation can still be remedied if both parties agree that eliminating the militants is in Pakistan's best interests. If that does not happen, fears will grow that Pakistan could become the next Taliban state.